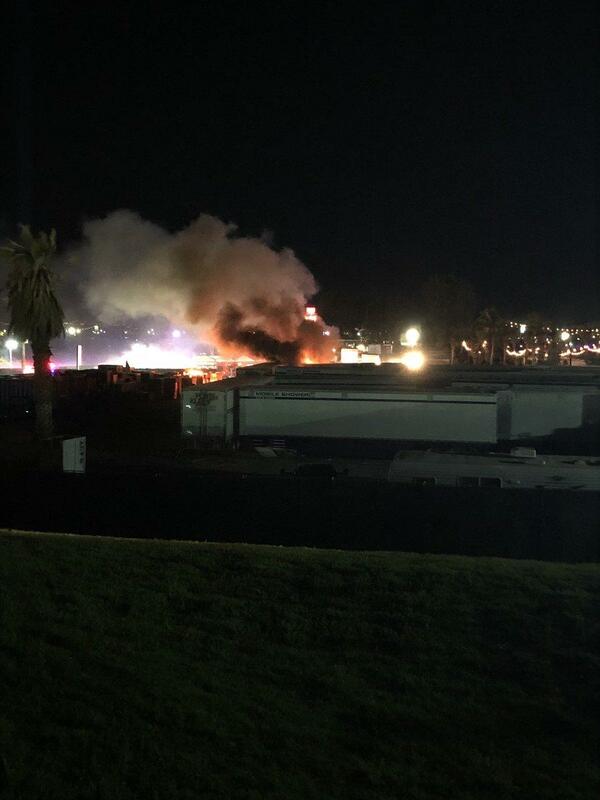 A mobile facilities trailer located in the center of the Coachella festival grounds caught fire Saturday. Riverside County Fire extinguished the blaze, with no injuries reported. INDIO (CNS) - Cat ears and fake ponytails are expected in high supply at the Coachella Music & Art Festival grounds as Grammy-winner Ariana Grande headlines the final day of the first weekend. Coming off a whirlwind year of tragedy and chart-topping hits, Grande will play for thousands of fans at the Empire Polo Club in Indio, which hosts the Coachella festival. Many of those fans will expect to cheer on the star as she says ``Thank U, Next'' to all her ex-boyfriends, including the late Mac Miller, who died of an overdose late last year and ``Saturday Nigh Live'' star Pete Davidson. Before Ariana performs, don't miss out on fellow Grammy-winner H.E.R. and everybody's favorite twerking flutist, Lizzo, as well as Khalid, Dillon Francis and Blood Orange. The final night of the first weekend is a cherry on top of the music cake with solid performances from a broad spectrum of artists on Saturday and earlier today (Sunday), including Tame Impala, Billie Eilish, Kacey Musgraces, Childish Gambino, Janelle Monae and Bassnectar. County Fire Department said. No injuries were reported. mechanical unit that heats water for the showers failed and sparked the fire. installations will also be on exhibit at the grounds. also act as important landmarks that help people navigate between acts. this weekend's Coachella Music & Arts Festival to ensure their desert experience doesn't include extended interaction with law enforcement. ``People just love it, and it's their Disneyland,'' Indio police spokesman Ben Guitron said. ``I mean it's a beautiful event. And, they make a poor choice -- or they are with someone who made a poor choice -- and then they are stuck spending time with us.